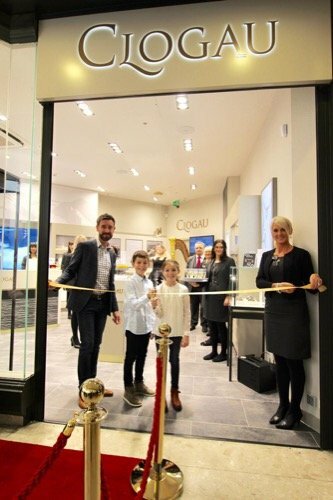 Welsh gold jewellers, Clogau’s has officially opened its latest store in Quadrant Shopping Centre. This also follows the recent successful launch of two store openings in Llandudno and Bangor. The new Quadrant store launched only a month ago and is already exceeding expectations. The new shop occupies 46sq. ft. and currently employs six permanent staff and two Christmas temporary staff members. Clogau jewellery is brand steeped in welsh gold mining history. Its jewellery is a collection of unique handcrafted pieces all of which have a personal and cultural meaning and a permanent tie to Wales. Commenting on the new store in Swansea, MD Ben Roberts, said: “As a business we have always considered Swansea as one of our prime locations. Historically the product has been more popular here than Cardiff so it’s a natural progression to have our own presence there. I am sure we can build on the brand’s popularity. Every Clogau piece contains rare gold from the Clogau St David’s mine in Snowdonia. It is the same gold that has been used to create wedding rings for some members of the British Royal family for almost 100 years. 1923 marked the beginning of this tradition which was carried into its 95th year with the most recent royal weddings of the Duke and Duchess of Sussex and HRH Princess Eugenie and Jack Brooksbank. Lisa Hartley, Quadrant Shopping Centre manager, said: “We are delighted to welcome Clogau to Quadrant Shopping Centre. It is a fantastic fit to our already excellent mix of quality retailers. We are huge supporters of local businesses, and Clogau has a particularly wonderful story to tell. Not only is it steeped in family history, but also the materials and techniques used are very traditional, which makes every individual piece unique to the brand.